Yesterday was the first official day of Summer! The weather is nice and hot which means it's time to pull out those bathing suits and have some water fun! 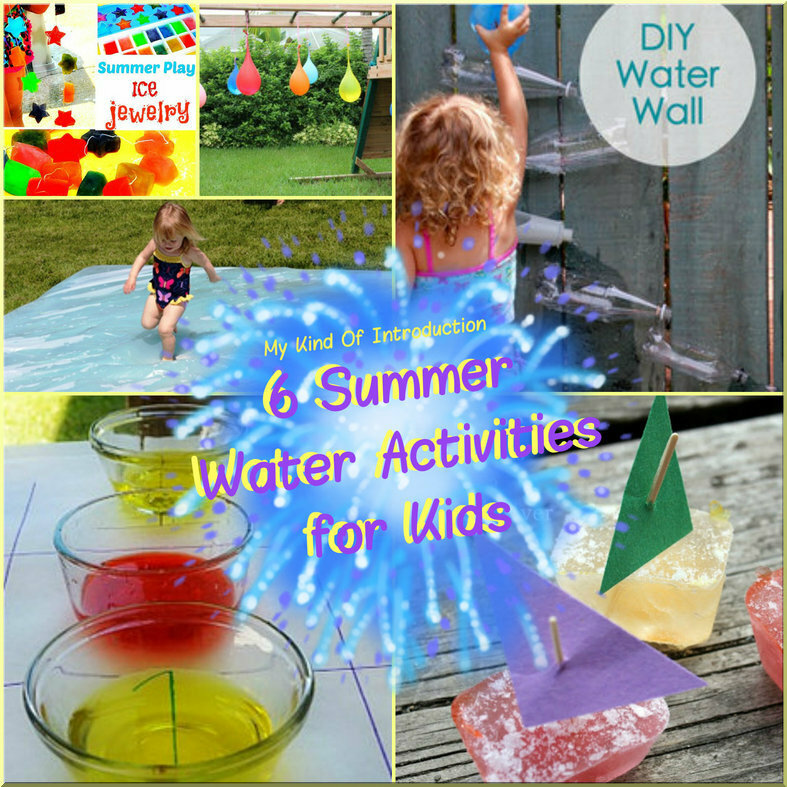 I've gathered up 6 great Summer Water Activities for Kids that are sure to cool them off in no time... All while having tons of wonderful fun! 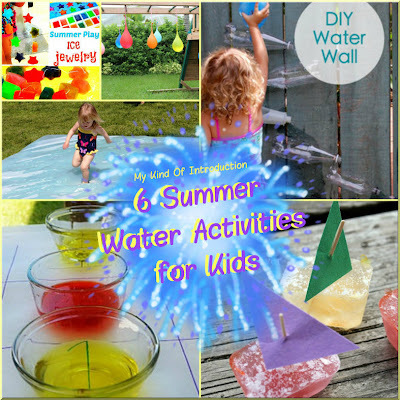 Enjoy the water this #Summer and get Creative!! View the original Activity Posts on their hosts sites using the title link above each project. All you need is -- Balloons, Yarn/String, Water, Hard stick or bat and WATER!!! Every one has played the age old game of tic-tac-toe but now that it's Summer time, it's time to mix things up a bit.... With water of course! Using food coloring and water you can being a whole new experience to playing Tic-tac-toe by taking it outside. --This would also make a great Color teaching activity to teach mixing colors to the younger kids! 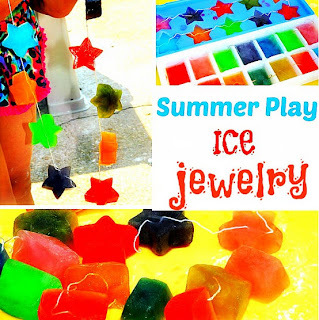 Try adding some tasty style to your Summer play with Ice Jewelry! You can simply use water and food coloring but I believe using the Popsicle's that come in liquid form, is a wayy better idea! Kool-Aid would work as well! --Make sure your kids aren't wearing anything that can't get stained since the melting ice may stain. Ice seems to have many fun options of creating fun. 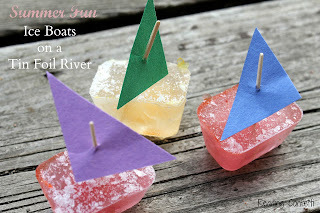 These adorable Ice Boats are sure to be tons of fun for not only the boys but the girls too! You can even make a DIY tin foil river to give your boats a path to take! Doesn't it sound exciting!! Instead of the river you could use a bucket, water table or other large container to hold water for the Ice Boat to float around in. The boats are made the same way that Kool-Aid Popsicle's are but with a toothpick or small twig stuck into the tops. The water blob reminds me so much of an under-filled water-bed mattress and looks like it just may be the coolest water activity that I've found yet! 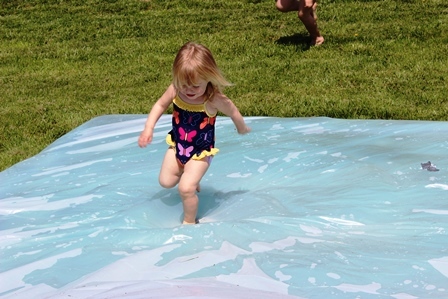 Using just a few supplies to make, the Water Blob can be an all day of fun! Add squishy bath toys and glitter to the center of the blob before sealing it and have a search game as well as the top play fun! Find lots of other Kids Activities, Crafts and DIY Projects by Following My Kind Of Introduction on Pinterest by clicking the button below! 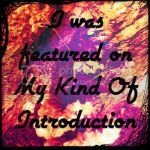 I loved your blog soo much that I blogged about you!! Oh how fun! I love fun summer water activities! Great ideas! Water blog and DIY water fall seem really fun. Can`t wait to try those with my daughter, when she is a little bit older. Oh man... these are great ideas!! 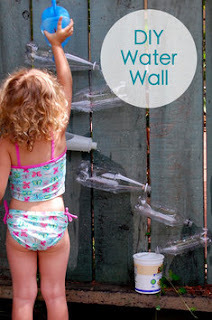 We absolutely love water play, and spend most of the summer in the backyard playing with water in some way or another :) Pinning now! !